Happy April! The sun is shining, it’s warming up outside (which doesn’t totally make me happy but we can pretend), and shorts weather is right around the corner. It also means it’s time to set share my April #goalgetter2013 goal. Surprise, surprise…. My April goal is going to be the same as my March goal! Seriously, I am TOO close to this goal to not aim for it again. Since March was not necessarily my lucky month and I ended the month at the same exact weight that I started at, maybe April will be it! 10% will put me at 160.2 lbs., just 3 pounds from what I weighed in at this past Saturday. And for the heck of it, I want to lose 1 extra pound and get back into the 150’s. And because this will be such a HUGE goal to meet, I will reward myself with a new yoga top I have my eye on at lululemon. I keep looking at it on their website and I don’t dare go to the store until I reach my 10%…. This will be a great treat to myself for hitting such a milestone! Which color should I get?? 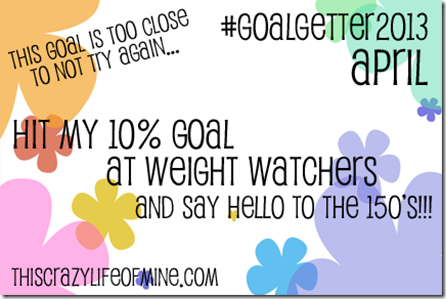 I would love for you to join in the #goalgetter2013 challenge? It’s pretty simple…. If you’d like to take part in this challenge and have another way to keep yourself accountable this year, you should definitely join in! Visit the #goalgetter2013 Facebook page today! What are your goals for April? Do you ever have the same goal two months in a row? You can do it!!!! Good luck getting after that goal this month!!! Thank you! The encouragement is always helpful. Jina, I have a feeling we’re alot alike. Black capris ALWAYS, lol. Thanks for the vote! It really is… Monthly goals is much more manageable than a years worth, in my opinion. Thank you so much for reading! That top is too adorable to not be able to hit that goal. So what if you didn’t make it last month. It’s a new month and with the warm weather coming around a little more, hopefully you’ll have some extra motivation. Either way, I know you can do it! I love the idea of rewarding yourself with clothes. I did that too when I hit 160 for the first time I bought myself a new shirt. Now my goals – 155 my running buddy and I get healthy lunch out post run. I have 5-10 pounds to go to get there though. Congrats on your progress thus far! You can do it!!! Good luck! » Goalgetter2013 – How did I do in April? vida familiar, decide visitar a la familia del novio, sin saber con lo que se va a encontrar. se por qué no. Puede ser que sea por algún bloquedor que le instalé.